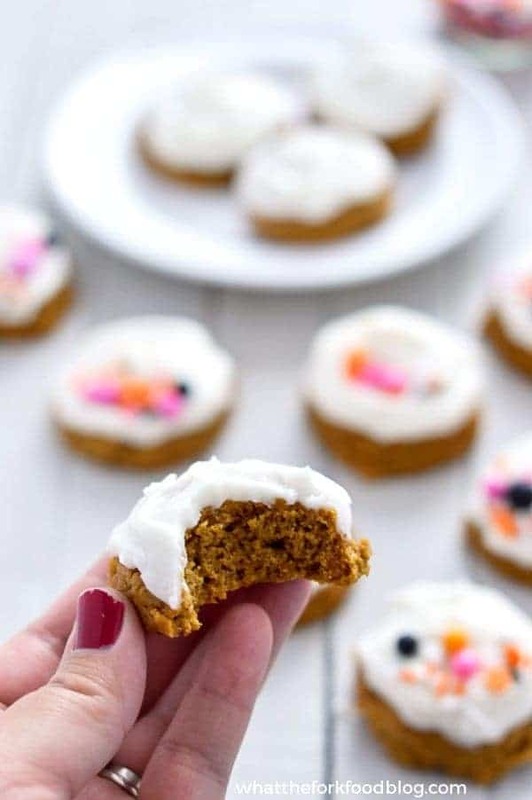 These easy Gluten Free Pumpkin Cookies with Cream Cheese Frosting are such a dreamy little dessert. They’re pillow-y soft and just melt in your mouth with that frosting! 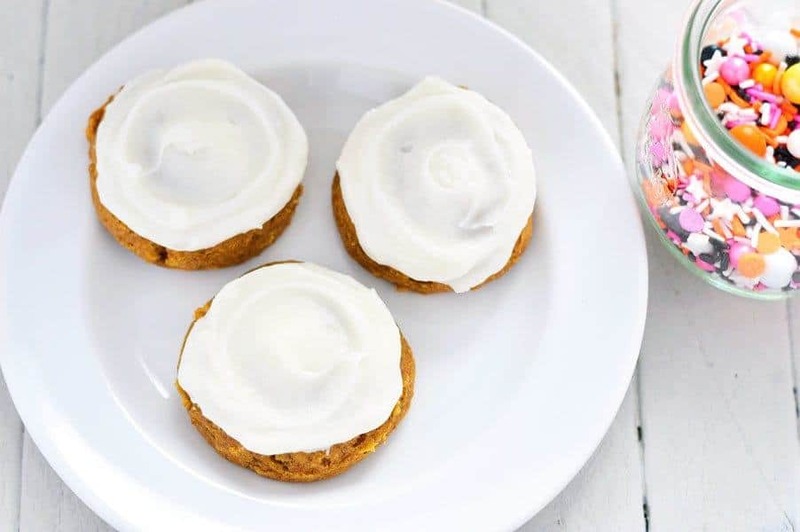 Calling all pumpkin lovers, these gluten free pumpkin cookies with cream cheese frosting are for YOU. They’re full of warm pumpkin spice flavor (I used a homemade pumpkin pie spice but you can use store-bought) and that cream cheese frosting is to-die-for. I’ve also made my pumpkin cake with cream cheese frosting a couple of times – just in different versions. I turned it into a layer cake by baking it in 3 8-inch pans for my sister’s birthday in September. I also scaled it down and made mini cakes with it. That’s right – that big ginormous cake turned into a little tiny layer cake that’s baked in ramekins and frosted to perfection. I’ve had been wanting to share that recipe for months now and I was finally able to share it recently. You’ll have to check out that mini pumpkin layer cake, it’s perfection! 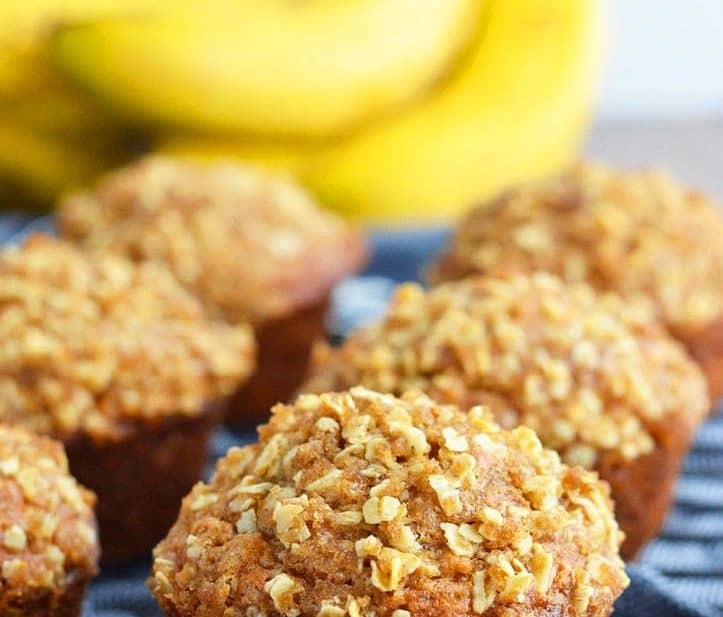 Are you looking for more ways to incorporate more pumpkin flavors? Be sure to try these Gluten Free Dairy Free Pumpkin Pie Bars by Megan from Allergy Free Alaska. And they are refined sugar free- bonus! 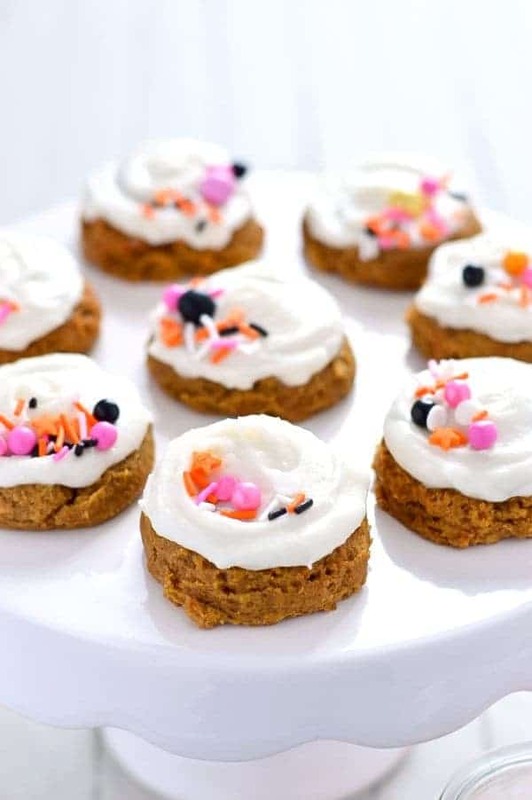 But, despite all the pumpkin action we’ve seen, I am SO happy to be sharing these cookies because they’re almost like the mini cakes, just in bite-sized cookie form! The cookies definitely have that soft, cake-like texture we all love. They’re like little pumpkin cloud covered in more clouds of cream cheese frosting. BTW, I also included directions for making the cookies and the frosting dairy free. It’s a win-win for everyone. I also topped these with a few sprinkles – you can never go wrong with sprinkles! My husband is usually a chocolate and peanut butter kind of guy and likes to complain when I make too many fruit desserts (technically pumpkin IS a fruit). However, that hasn’t stopped him from snacking on these every night since I’ve made them. And, to clarify, by complain, I mean a friendly grumble about how he needs more chocolate in his life. Enjoy! 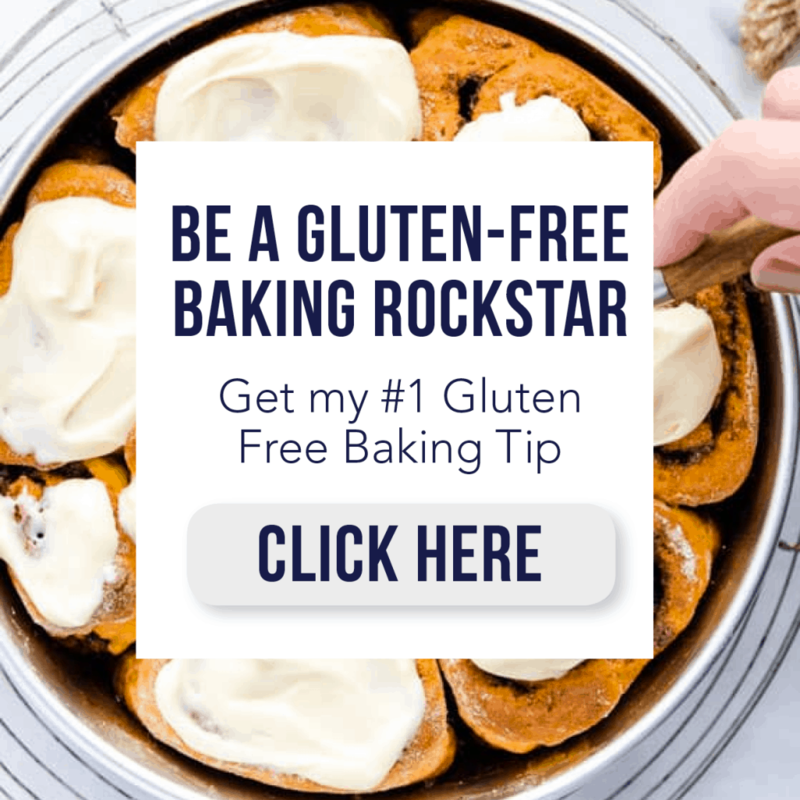 This gluten free pumpkin cookies recipe can also be found on Food Fanatic, where I am a regular contributor. Love a nice soft cookie! 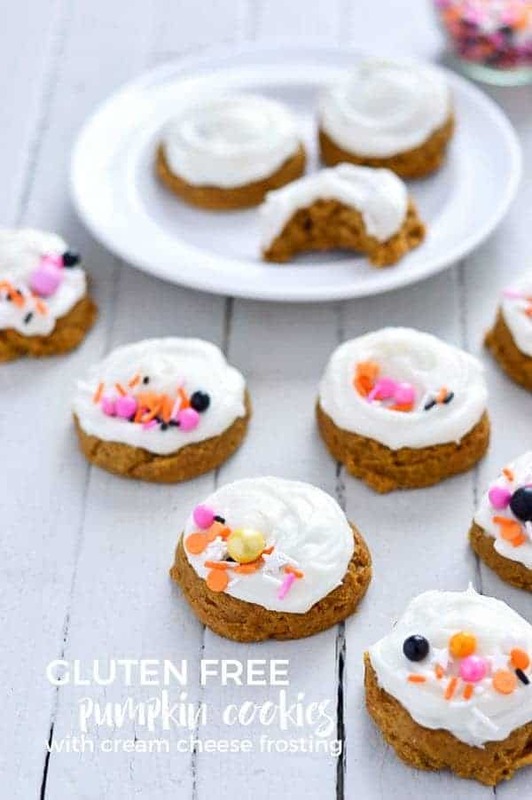 I make a dairy & egg free version of pumpkin cookies but I just love those sprinkles you added on there. Sure makes it look more delicious. With that frosting!!! 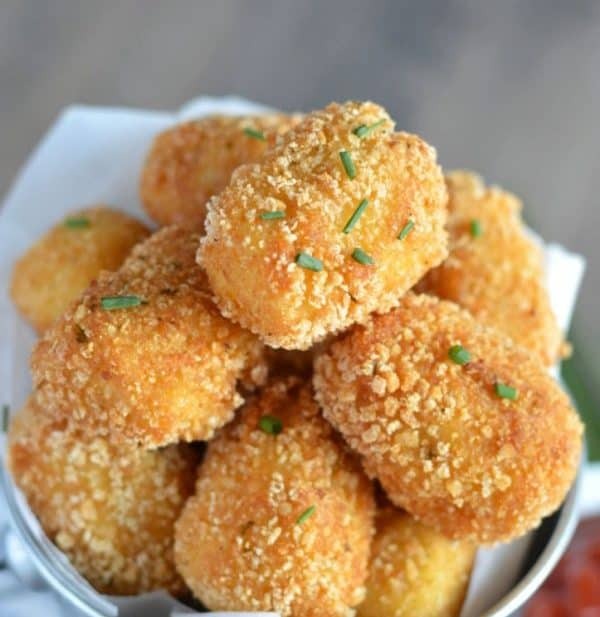 Oh my goodness these look amazing! Oh my goodness, these are so cute! Not to mention, pumpkin is the bomb. How pretty are these?! YUM! You can’t beat a great soft cookie, particularly when there’s pumpkin involved! These cookies look amazing!! 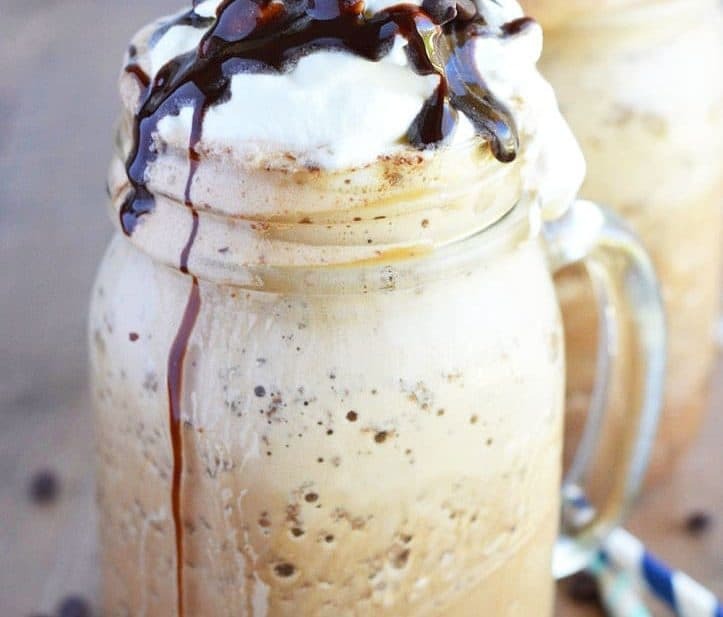 I can’t wait to make them for my family!! These cookies are SO PRETTY! Love the frosting! Mini cake cookies, oh my gosh, YES! I love the icing and sprinkles too! Pumpkin and cream cheese are a classic combo. Plus those sprinkles!!! Love the flavor combination, looks delicious. The soft texture and the creaminess it melts in your mouth. What would they do without the xanthan gum? I don’t have any on hand. Thanks! Made these delicious soft, easy to make cookies last night. Yummy! Thanks for sharing! I made these with gf pancake flour thst already had the gum in it…they were amazingly good! Thankyou for sharing! Thanks Kellie! Was it the Pamela’s mix?